The next time I have an idea that I’ve let stew far too long in the corners of my imagination, and I want to make it a reality, all I need to do is blog it. Who knew? 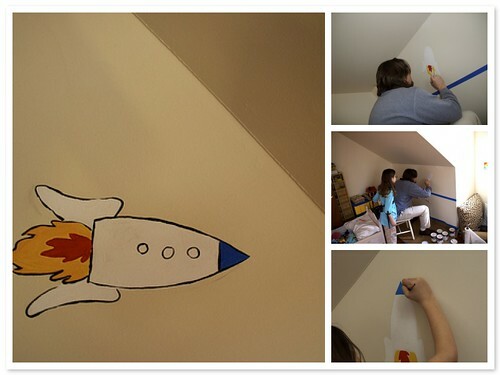 After reading my post about the kids’ room, Tomas got to sketching, and sketching (some doodles not at all appropriate for any child’s room, btw). After Tor got up from his afternoon nap we bundled the troops into the car and headed to Home Depot where we picked up the brightest, and cheeriest Disney paints we could find (The red is called "Mickey’s pants". That makes me laugh every time I think about it). We also bought a rake, and now have HUGE piles of leaves from last Fall that I’m really not sure what to do with other than jump in ’em, which I did. Hopefully, we won’t have too much wind between now and the moment I figure out how to dispose of them. Today we set to painting. My job is to get the supplies together, lay down the protective paper and tape, and clean up. Um… and keep Tor out of the paints. 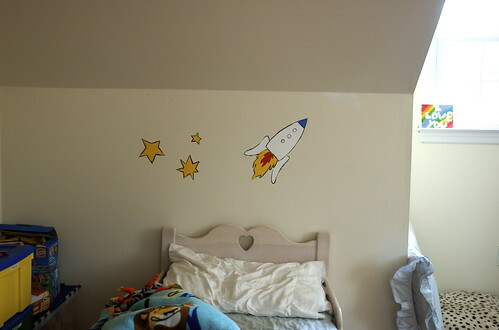 Tomas and the kids did all the painting and I think this rocket ship over Tor’s head-board is the start to a most magical room. Next time I’ll show you the tree they painted. Oh, my… and what a tree it is! Get some big wire to make a ring around those leaves and make some compost for your garden! Bags of fall leaves and summer (untreated) grass clippings are GOLD at my house! mmm, that kids rooms was gorgeous to being with. heck, I wish MY room were that nice!! The new decorations are super cute too! These are AWESOME. Your kids are so lucky to have such an artistic mom.